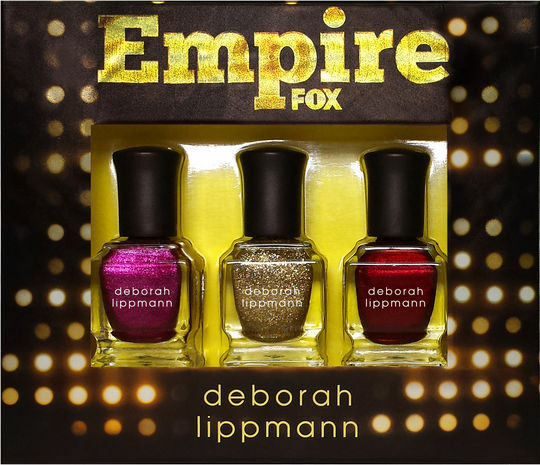 Good news for Empire fans: Deborah Lippmann just announced a new nail polish collaboration based on the hit television show. The limited edition three-piece set will be available mid-November. Named after songs performed on the show, each nail polish is definitely fierce in its own way—just like the characters we’ve all come to know and love. Shades include Hustle Hard, a fuchsia shimmer; Power of the Empire, a gold glitter; and War of the Roses, a ruby red shimmer. Not a stranger to successful television collabs (remember the Girls and True Bloodcollections?) it’s unsurprising Lippmann was able to capture the iconic style exhibited throughout the show through these fun shades. Oh, and how great are they for the holidays? Definitely the perfect gift for your TV-obsessed friend or coworker, am I right? The collection is $24 and available in November at sephora.com and nordstrom.com. Not going to lie, I’ve never seen this show but the colors in this box are so hot! I really want this set! When I find this set I’ll definitely come back to this post and lyk how it went for me!